Starring Robert Englund, Jere Burns, Clint Howard, Candice De Visser, E.E Bell, Michael Eric Read, Renee Dorian, Courtney Gains, Erick Chavarria, Chasty Ballesteros. 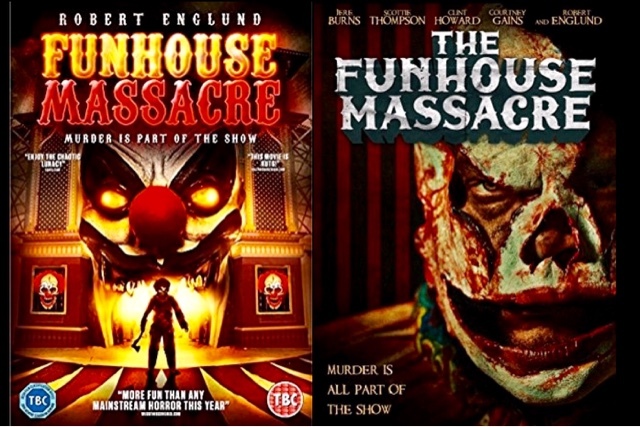 What can be said about The Funhouse Massacre apart from fun, another film with a hint of 80's slasher movie feel about it, it certainly shouldn't be confused with Funhouse 1981 by Tobe Hooper. 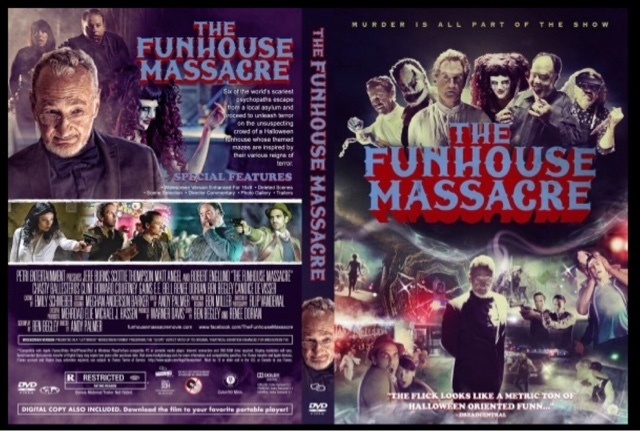 This film, Funhouse Massacre I have seen on Netflix for some months, but with extra work responsibility and extra hours, my blog and my appetite to watch movies did dwindle for a while, and my depression crept back on me again, so most horror films were off the menu for some time. I have got back into the horror groove once more, and I have seen, and purchased quite a lot of horror movies, I watched this in the early hours of the Morning I finish work at 1,00am and watched this until 3,00am, and I loved it, the film was clichèd, violent, with some great kills, almost too predictable until the great ending, that was genius. The film was a little naughty to include Robert Englund in all promotional material as he is only in the movie for the first few minutes, but just having this horror icon in this movie is enough to encourage people to see it, with another horror icon cameo such as Courtney Gains from Children Of The Corn and The Burbs fame. This movie is violent it is bloody, we have some of the best decapitaions seen onscreen in quite awhile, we have gruesome images of people with mouths and eyes sewn together, drills going through heads, throat cutting, and a brilliant mallet through the head, taxidermy using live human bodies, and a cannibal chef who's passion for meat is taken to a new level. Although this movie was made in 2015 I cannot stop thinking that is was a copy of 31 meets Death House, I know it cannot be possible because of the time difference in film making, but the three films are very similar in the fact they all have multiple bad guys to take down and kill and maim innocent teens and young adults, but the film does deliver on the gore, and the laughs, it is not to be taken seriously, but like a roller coaster, just strap yourself down and enjoy the ride for 90 minutes.